Mississinawa Valley 2019 Lady Blackhawks softball team. Shell was a standout softball player at Covington High School leading the Buccs to the State Final Four her junior year as a pitcher. In her career as a Buccaneer her teams won 2 district titles and a regional title. She pitched a perfect game against Bradford her senior year and had 439 career strikeouts and a 48-8 pitching record. Shell went on to a great career at Bluffton College where she was part of 96 wins. She was 3rd in school history pitching 43 wins and 2nd in history with 82 stats and 2nd in history with 10 shutout wins. She will be looking to impart her knowledge of the game onto an eager group wanting to learn. “Our team strengths will rely on our having a great attitude,” Shell said. “A lot of these girls are new to the game but the positive and motivational atmosphere in practice is what is going to get us some wins. Having only 4 returning players is daunting for some coaches, but exciting for me. I essentially have a blank canvas to work with and they are very eager to get better each day. It has been very exciting watching us progress and picking just 9 players to start is going to be a tough decision. The 4 returning players include the only senior Bailey Johnson, a junior Lindsay Johns and two sophomores Taylor Collins and Bailey Emrick. Bailey Johnson will see most of her time as a catcher and at 3rd base and she knows game and will be looked to for leadership behind the dish. Lindsay Johns will see action as an infielder and a pitcher. She is a solid hitter and will see significant time as a middle infielder and in relief on the mound. Taylor Collins is a left handed pitcher who will see most of the time on the mound. She is a good leader for the team as well. Bailey Emrick will play 1st base, she didn’t see a lot of playing time last year but will contribute as one of only 4 returners and transition to an infield position this year. The Hawks will be developing 8 additional players for the squad this year. Maria Ojeda is a sophomore and will see time in the outfield and 2nd base. She has never played before but has made a great transition to the left side of the box and continues to impress. Gabby Rammel is a sophomore and will see significant time in the outfield and continues to get better each day. Maddie Townsend is a freshman Catcher and 3rd baseman. She will share catching duties with senior Bailey Johnson. She has hitting power and is expected to make an impact from the start. Mackenzie Hamilton a sophomore outfielder is another that has never played before but continues to impress as she quickly learns the game. Karista Davidson another sophomore outfielder is one of 3 lefties on the team and the best hustler and her effort does not go unnoticed. Cammie Johns is a freshman 2nd baseman and outfielder, she has a lot to learn but has some prior experience on the diamond and they will look to her often throughout the season. Jaylen Baker a freshman outfielder has a way to go … but comes out with a positive attitude each day with an eagerness to learn. Haili Young is a freshman who rounds out the roster and has gotten better each day and will see time in the outfield. Coach Shell believes Newton, Arcanum, Bradford, and TCN are obvious contenders for the CCC this year. “They have veteran players and coaches that understand what it takes to be at the top.” Shell said. “I know Miami East has a strong softball tradition that is not to be forgotten, I would not count out FM or Trail either. Softball is so great because it could be anyone’s game on any given day. We are looking to compete and finish in the top 8 this year,” Shell added. “Our team goals are simple. We are striving to get better with every opportunity. I would like to go 10-15 on the season and make it to sectional finals. I believe that is an attainable goal with the strong willed group we are working with. We are finally building a program here for softball, and that is something to get excited about,” Shell concluded. 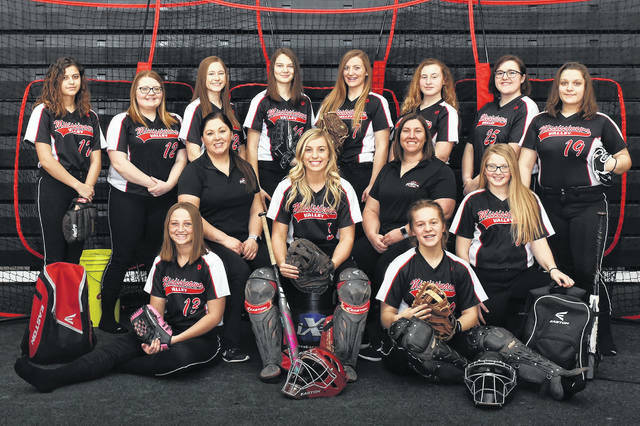 https://www.dailyadvocate.com/wp-content/uploads/sites/34/2019/03/web1_MV-Softball-Team-8-inches-1.jpgMississinawa Valley 2019 Lady Blackhawks softball team.